I'm even more inept at horticulture than I ever imagined. You may remember my previous post about being unable to raise healthy basil plants in my kitchen. And about my awe at how easily Bonnie seemed to be able to produce bushels of basil, almost at will. It was a classic case of basil envy. Well, I made a shocking discovery in my kitchen this week that has left me completely demoralized. You see, I was secretly assuming that Bonnie was just working with a better grade of basil. 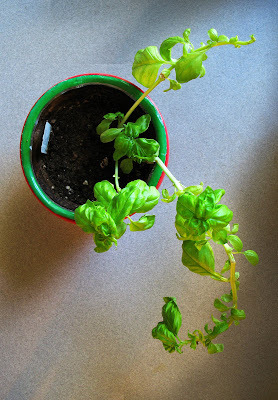 My ineptitude alone could not explain the difference in the size of our basil plants. Maybe she had tough, street-hardened New York City basil, while I was trying to get by with this laid back, drifty, unfocused California basil. That theory, it turns out, is just so much fertilizer. Not only are our plants from the same stock, but Bonnie has been supplying the very basil plants I've been trying to grow all along. In fact, I've been up against a pro. 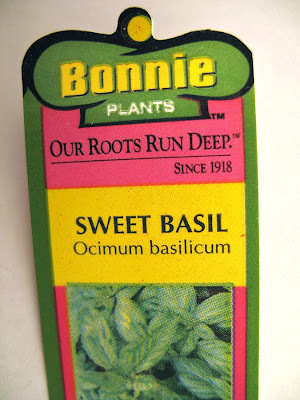 It turns out that not only has Bonnie been overly modest about her gardening skills, but that she's this major, big-time basil mogul whose basil plants are distributed all over the country. I didn't have a chance against this kind of competition. Check it out. Here's her website. That's so like her. She was just too modest and polite to tell me what a total oaf I've been. She even knows the latin name for basil: Ocimum basilicum. Like I said in my first post, these professional bloggers are a sharp lot. They're street smart and wise in the ways of the world. I'll have to hone my skills if I'm going to rise from the ranks of commenters and make it in this league. Wow. And Bonnie is a lot older than she looks in the photos on her kayaking blog. According to her nursery website she started the business in 1918! OMG, that is a sad looking plant. Mine use to look like that when I tried to grow them WITHOUT enough light! Yeah thats right I do gardening also! That is touched on on my other blog! Oh and make I pesto, Aw yeah!. What is really sad on your post is not even one word about sailing, O_Dude know you no shame?! It is a sailing blog! 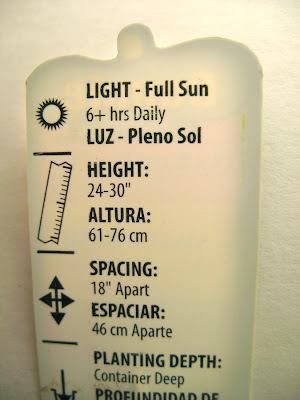 At least say , I'm growing this to use on the boat fro lunch on the hook on something to tie it in. Even Edward has a seperate blog about his swimming. However...in all fairness, even the Blogfather has derailed his Blog from time to time...BUT, he is the blogfather, you are just starting and already shamefully faltering! E tu O Doc?! Save your self respect tell us about how your F-coils survived the typhoon something nautical! Show some bloody pride man!! My reaction was the same as T-mans, except I thought, "Wow. The old broad looks fantastic!" And then I thought, "Wow. Maybe she met Queen Lili, or the Duke, since she was living in paradise in her school years." Zen, yours is not the first reference to insufficient light - Bonnie also told me these fussy little plants needs lots of light, and Pandabonium suggested I move the plant to the deck of my boat. The little tag in the pot says that, too. I guess I should make some changes. But I'm surprised that you, of all people, do not see the connection to sailing. We must consider the well-being of the whole sailor. Man does not sail by jib sheets, winches, and halyards alone (in fact, Laser sailors have none of those things). The sailor must be happy within - in his heart, in his mind, and, yes, even in his belly - if he is to take on the challenges of the sea. And Zen, basil makes me happy. Greg and Kris and Tillerman (both of you), I think there is a simple explanation. Bonnie Plants is a family business that was obviously started by earlier generations of Bonnies. I guess it is strange that they've passed down the first name, though. Maybe, knowing how finicky basil is, they didn't want to mess with a successful formula. It is true. I do write about non-sailing stuff on my blog but that is because I gave my readers a choice last November of what they wanted me to write about. The overwhelming winner of the election with 71% of the vote was the option for Tillerman to write about Whatever The Hell He Wants. Sailing was a distant second. So you're going to have to put up with Whatever The Hell He Wants for at least 4 years, maybe 8. Good heavens, the basil's out of the bag. Well, thank heavens nobody's brought up the tomato blight yet. Not that Bonnie Plants had anything to do with that or anything. If you were to go to sea for 1001 days nonstop (you know, to break a record), you would certainly need to know how to grow basil. It is, after all, the main ingredient in pesto (the secret food group at the top of the food pyramid). I don't think I would ever try going to sea for 1001 days. Not because it wouldn't be a cool thing to try, but because my efforts to grow basil would meet with such ridicule over at Sailing Anarchy, that I would be completely demoralized. But you would know that people were waiting for your next words with bated breath. You'd never post a post and find yourself thinking "Gee, I wonder if anybody actually reads this thing". But there would be another problem. It would be very tricky plotting a course that accurately resembled the outline of a basil leaf, as the leaves vary quite a bit and have no clearly defined characteristic shape. Oh, I feel like SUCH a killjoy, but I just can't make fun of Reid with that crowd over at Sailing Anarchy at 25K posts & no sign of getting tired of the game. Reid was one of the gang at Pier 63, the Schooner Anne scene was always a little too new-agey for me to really get involved, but there were some really nice people involved, I still run into them now & then and the whole Sailing Anarchy business has really distressed them. That being said, maybe that's what he's doing there off the coast of Africa - trying to draw a basil leaf & just not quite getting the shape right. Hey, if I'd been at sea for over 900 days I'd be missing fresh basil enough to pay some sort of major tribute to the stuff. And once I'd managed a basil leaf, I'd move on to something more challenging still - chard! Or maybe an heirloom tomato. Had my last ripe one for breakfast this week. Hoping the green ones can hang in there 'til next week, when I'm going out to see TQ - he lost his tomatoes to the blight (see, there's proof it wasn't my fault, what kind of girlfriend would I be if I'd given his garden the blight?) and became an instant expert in green tomato cookery. Freezing my last pesto of '09 tonight, yes sir yes sir 3 bags full, thoroughly doctored up with sundried tomatoes & pine nuts in hopes that that'll cut the bitterness a bit. 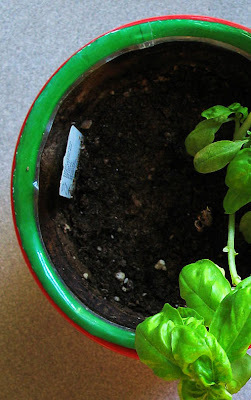 My basil boasts are over until 2010! So did O Dock survive the storm OK? oops. way to kill a comment thread, eh? By the time I discovered this peculiar online world of sailing sites, blogs, and fora, the whole Reid thing had already pretty much played out. If I were smart, that's all I would say about it. When I did hear about the SA feeding frenzy, I was curious and started reading through the threads over there. I didn't get too far. I felt a little sheepish reading that stuff - and maybe more for the writers than for Reid. I think, in time, maybe some of the writers started feeling that way, too. At least, I hope they did. I'm guessing it was something like waking up after a party where things got a little too wild and wondering just what had happened. Never having been to such a party, of course, I can only speculate. Yeah, the guy sure set himself up for some of what he got, but I can't help but think that more than a little jealousy was feeding the flames, too. How many of the snarky will ever cross oceans under sail? How many will ever be free enough to try something like that? How many of them will ever attract a woman half their age to follow them? How many will ever attract a woman? We now return you to our previously scheduled programming. I used to joke that Reid could post a post that said "The sunrise was beautiful this morning", and the SA crew would find some way to ridicule that. I was mostly kidding, but then one day Reid had posted one of his less out-there posts. He used the term "whale" in talking about "killer whale". And sure enough, somebody on that SA thread goes off, oh, ha ha ha, Reid's so dumb, killer whales aren't whales! The sad thing is that I think what really fed the SA fervor came from a blog that somebody decided to set up an unofficial Blogger blog where they posted Reid's updates, so people could leave comments. The SA crew did a complete (regatta) dog pile, the guy who was doing the blog started deleting them. I don't know the entire story, but I think that was about when the party got out of hand. And the SA gang enough dirt from a very, very angry ex-girlfriend of Reid's to really have some fun. Ah well. Reid drifts on, and in the end, I suspect that when he gets back & starts trying to sell some art, the old "there is no such thing as bad publicity" is probably going to hold true. Are they still being mean to the "other" tillerman over at SA? The one that faked his online suicide? Geesh, I'd think anyone else named 'Tillerman' would have changed his name by now. Just like the Wisconsin Tourism Federation had to when they discovered their acronym means a lot more today than it did when they started out. No, the other tillerman is still out there, in spite of my pointing out to him that I'd been using that name for blogging much longer than he had.